It's 08:53 in Payne, USA right now. I-15, M.P. 123.7 A view of the current traffic situation. 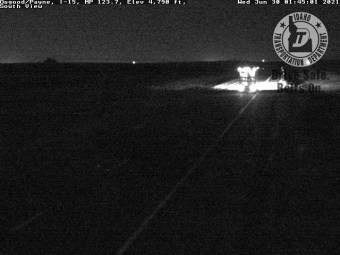 Osgood, Idaho: I-15, M.P. 129.9, 2.5 miles away. Idaho Falls, Idaho: I-15, M.P. 119, 6.1 miles away. Ririe, Idaho: US-26, M.P. 352.8, 14.5 miles away. Ririe, Idaho: Antelope Flat - US-26, M.P. 366, 14.5 miles away. Thornton, Idaho: US-20, M.P. 328.1, 16.5 miles away. Sage Junction, Idaho: I-15, M.P. 143, 19.2 miles away. Blackfoot, Idaho: Blackfoot R.A. - I-15, M.P. 101, 30.2 miles away. Atomic City, Idaho: Telegraph Hill - US-20, M.P. 279.4, 39.1 miles away.